Observation systems on air platforms can produce a very large amount of information, but its more and more a challenge to send this data amount in real time and in a safe way to the base station. A particular weakness lies in the limiting communications capabilities. among the mobile assets and control center. Radio communication links in general are the bottleneck for efficiently using the increasing observation systems capabilities. Without a capable high speed secure data link airborne imagery data must be stored on board until landing or transmitted over vulnerable radio links and inherent data quality losses through data compression. A powerful communication capability between earth surface and aerial assets is the key for fulfilling the demands of situational awareness, early warning and reaction in e.g. reconnaissance and surveillance missions. The innovation in the proposed laser optical link is our patented high quality aberration free telescope with a broad spectrum band for transmit, receive and video channels connected to a common main optical systems. Accurate pointing and tracking capability is provided for both (flying platform and ground base) ends allowing fast moving communication channel ends and achieving a power efficient narrow radiation beam. The narrower beam concentrates a larger fraction of the transmit power onto the link receivers, and will allow to transmit more data over longer distances, while requiring less resources from the flying platform e.g. power, mass and volume, that is extremely important for lot of flying platforms. This proposal aims at developing breakthrough technology for high speed data transmission for flying platforms (incl. small satellites as the next step), for any distant flying platform including unmanned aerial vehicles, aircraft or rockets, specialized balloons, etc. Technology can be used as well for fixed station terrestrial communications, up to 50 km, if direct line of sight provided. This is especially important for forthcoming high speed fifth generation (5G) of mobile network technology, where large amount of data via longer distances is crucial. FSO communications despite the expected benefit which could provide to enhance capacity, flexibility and availability are still at an early maturity level, for wider application flying platform scenarios. The reason is lack of suitable optical system and precise pointing systems. Company team has designed an alignment circuitry to remedy the problem of precise pointing. As two nodes are mobile with respect to each other, they will be loosing and re-gaining their alignments with each other, to solve the problem the specific transceivers used for communication in both nodes should be changed as the nodes move. Auto-alignment circuitry delivers immediate auto pointing of laser beams at both ends. 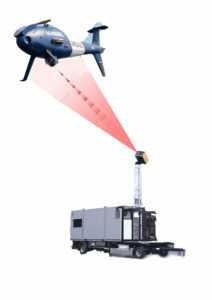 Since the auto tracking feature always provides maximum power to the receiver, the unit is capable of highly reliable and stable communications. As per best of our knowledge nobody did this for non-space application. Even the most advanced terrestrial free space optic manufacturers who provides auto tracking for a point-to-point wireless optical beam transmission systems, does by far not at this precision. Significant optical link budget improvements become possible only with help of very narrow divergence of optical beams and precise pointing systems. Geometrical loss counts for the losses that occur due tu the divergence of the optical beam. The result of divergence is that most of the beam energy is not collected at the receiving side.